On Sunday 20 May the club hosted a walk in conjunction with Cork Walking Week. The walk was the Clara loop walk which is 10 klms long. Using the power of social media and some old fashioned posters we advertised in the area. 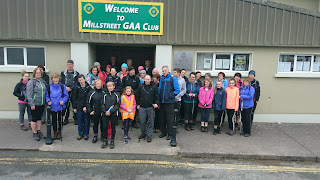 We timed the walk for 13.30 with registration at 13.15 in the GAA Hall in Millstreet. This was new territory for us and we weren’t sure how many to expect. Thanks to the generosity of sponsors we had an ample supply of fruit, chocolate bars and water available for all walkers. The turnout was better than expected. 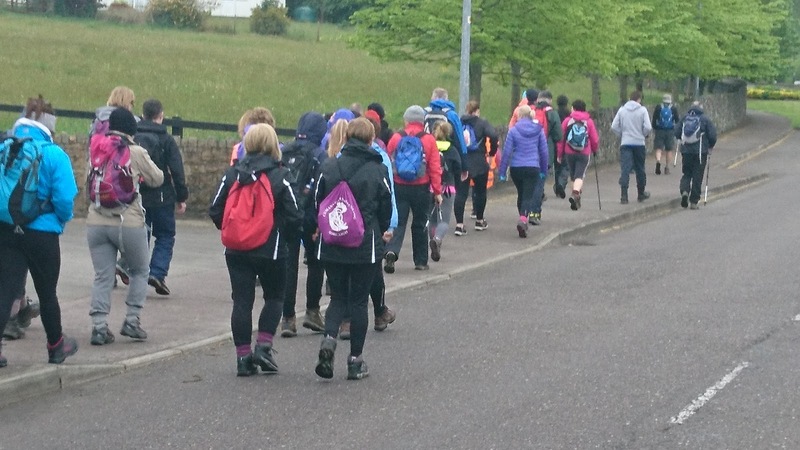 It was great to see so many people, young and not so young interested in doing the walk. After registration and a quick talk on the rules for the day we headed out of town, down the Clara road. Passing the grotto we turned left and continued for 500 meters before turning right into Mount Leader wood. Through the wood until we reached a stile. Our trail then skirted the forestry. We eventually came to a gate which led to open mountain and the summit of Clara loomed above us , shrouded in mist. This is where the climbing began and the talking stopped. We regrouped when we conquered the first hump. The weather got misty now and there was a fresh breeze. Rested we continued upwards until finally the iron cross emerged from the gloom. Clara at 452 meters is the most easterly summit in the Derrynasaggart mountains. On a clear day it is said you can see nine churches from here. There are some great views to the west and to the east the Galtees can be seen. However today it was not to be. We continued to the trig point and westward down open mountain. As we descended the day brightened and we got some nice views to the west and north. We reached a stile and went along by a fence before turning right and onto a farm track. We took a breather here. We continued along some fields,then traversed the lower flank of Clara through a forestry. Finally we emerged at the track we had taken on our way up.From here it was a simple stroll into town. Reaching the car park we had a roll call to ensure that all had come back safely. We proceeded to the Wallis Arms for a welcome cup of tea / coffee and a chat about the day. 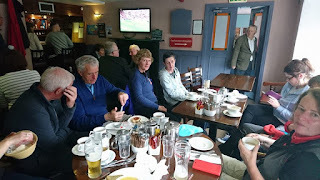 Also we saw the last quarter of the Cork / Clare game. Cork emerging winners. It was a very good day out and from the positive feedback it seems everyone enjoyed it. We have beautiful mountains on our doorstep and the best views are from the top. Hope that we will see you all again soon. Thanks to the club members who showed up to help out. Also to everyone, walkers, sponsors and anyone who contributed to a very successful day out.